Now that you’ve structured your business plan and created your initial product or service, you’ve come to the most important stage – selling your idea. 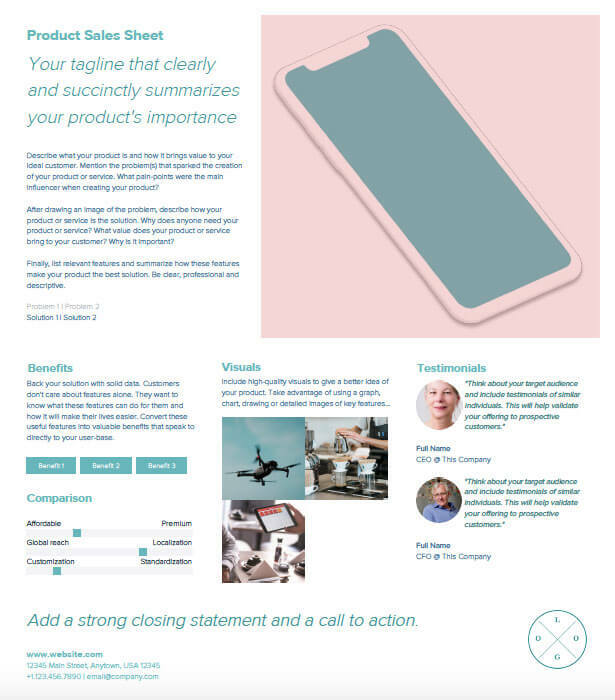 Instead of spending a lot of time meeting with people face-to-face and making calls to pitch your new idea, a great modern alternative is to create a ‘live’ Sales Sheet that clearly and concisely outlines your product or service and then you can easily share this sheet with internal teams, interested stakeholders and prospective clients. 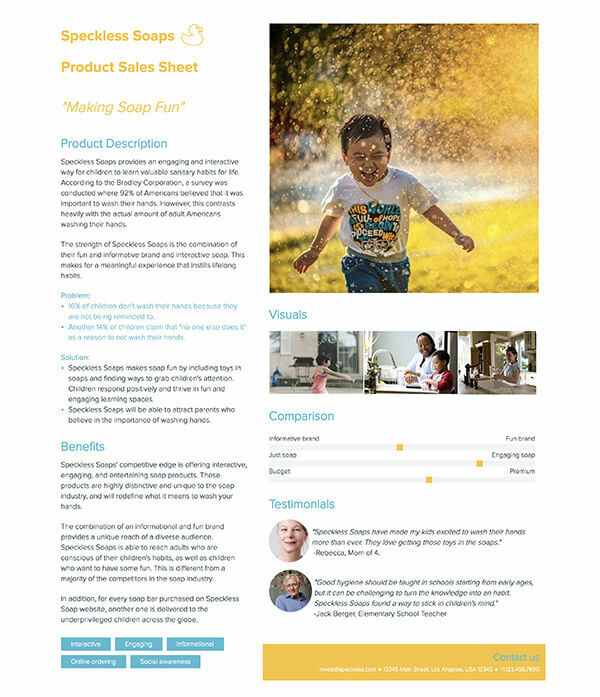 Create a Sales Sheet now for free! 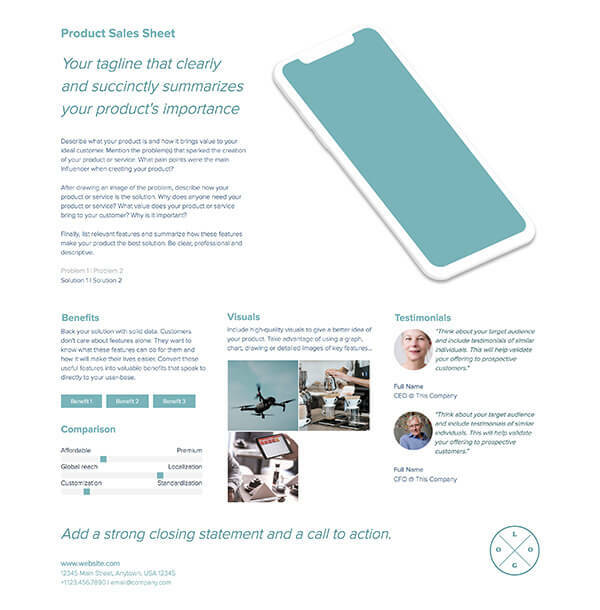 Your starting point to create and share beautiful sales sheets, without any design experience. Design anything from simple strategy docs to pitches, agendas, reports and other business and marketing collateral. Share a live link. Present. Export. It’s the easiest editor ever. 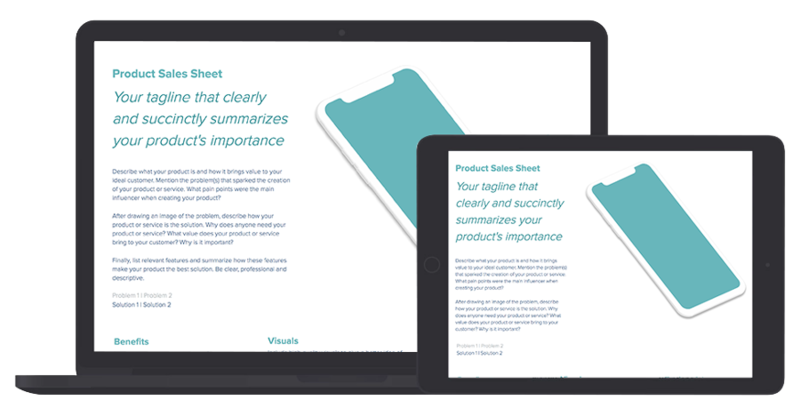 What is a Sales Sheet? A sales sheet, also known as a sell sheet, a sales slick or a product datasheet, is a strategic tool you can use to promote your invention, product or service on a single-page document. It includes the description, a list of features and benefits, pricing and related visuals of the product or service you’re offering to showcase it in the best way possible so you can convert people into purchasing. The sales sheet is a powerful document to take advantage while reaching out to prospective customers, investors and stakeholder. Thus, it is very important to make your sales sheet as clear and professional as possible while highlighting why your service as a solution for your target customer’s pain points. Why do I need a Sales Sheet? Raise questions and build brand recognition. Highlighting key benefits in your sales sheet will make your concept stick in prospective customers’ minds and they’ll come back wanting to know more. Quickly and easily present your product or service idea with numerous people without having to meet face-to-face or make cold calls. Here are some tips and tricks for filling in the Sales Sheet template. Visuals are key when it comes to grabbing prospective customers’ attention. Your main image is the largest element of your sales sheet, which means that this needs to a be a great image. It should highlight what your product or service is and should be a high-quality visual. If you’ve created a prototype for your main product shot, you may want to hire a graphics artist to really make this image pop. Bonus tip: If you’re planning on strictly sharing your sales sheet digitally, you can even create a short intro video as your main image. Xtensio’s editor offers a variety of interactive and visual modules so you can create your folios however you need. Modify the title: The title of your sales sheet should be descriptive of the product or service you’re presenting at first glance. You can add dates and contact information in this section as well. Remember, by sharing your folios as responsive links, you can change your title, update the description and refresh the date to update anyone who has the folio link, anywhere in the world. Edit the tagline: This is the catchy phrase that clearly showcases your product in a one-line benefit statement. Think of the biggest benefit your concept provides to your prospective customers and convert it into a memorable tagline. When choosing your main image, you should also keep your tagline in mind and try to relate the benefit in your main visual. For example, if you’re selling a new real estate app that simplifies finding homes and making offers, your main image should show buyers relieved while using your product during the home search process. Describe your concept: Explain what your product is and the values it brings to your prospective customer concisely and powerfully. You want to make sure you describe the problem that sparked the creation of your concept. What pain points influenced your idea? Because your idea was sparked by a problem you were seeing, your concept inherently solves a problem. You want to clearly explain how your product or service alone is the solution to the problem you’ve outlined. Why should someone choose to use your product or service and how does it make their lives easier? After describing the problem and solution, highlight the problems and solutions in one or two-word phrases to make your sales sheet easy to scan. Speaking about features alone will not be enough, at least it won’t make you stand out from the crowd. 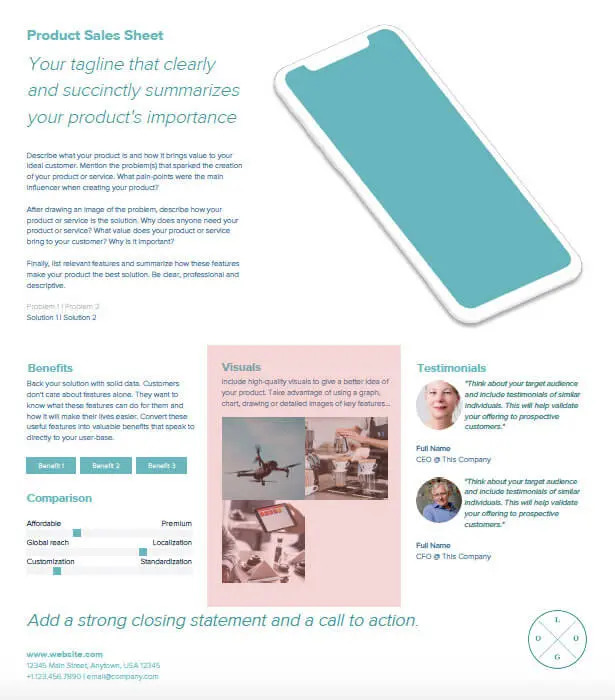 To be able to create a killer sales sheet, you will need to highlight connections between the features your product or service includes and the benefits potential customers gain from these features. Show your customers how the features of your product benefit your target customer and back your statements up with solid data. At the end of the day, customers are looking for an answer to one simple question: How does this concept solve my problem and what are the additional benefits of using this product or service? Use the comparison slider module to showcase the benefits your product provides compared to the alternative. 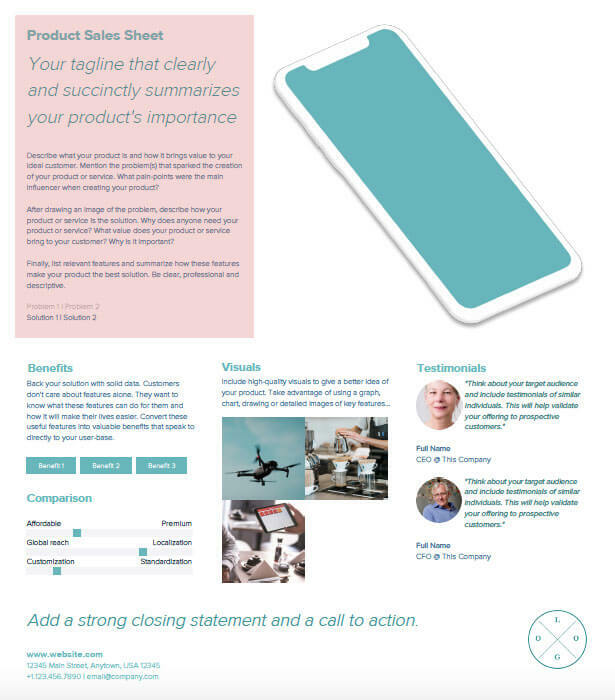 Visual cues as to how and why your product is the solution for their problem will make your idea stick in prospective customers’ minds long after they see your sales sheet. Bonus Tip: Loop in your whole sales or bizdev team as collaborators during the creative process align your thinking and create the most effective sales sheet for your overall business goals. This is where your sales sheet can truly show its power. On a regular sales call or meeting, you would probably mention features of your product, drop all those big numbers and list various benefits; but would they really stick on people’s mind to make a lasting impression? 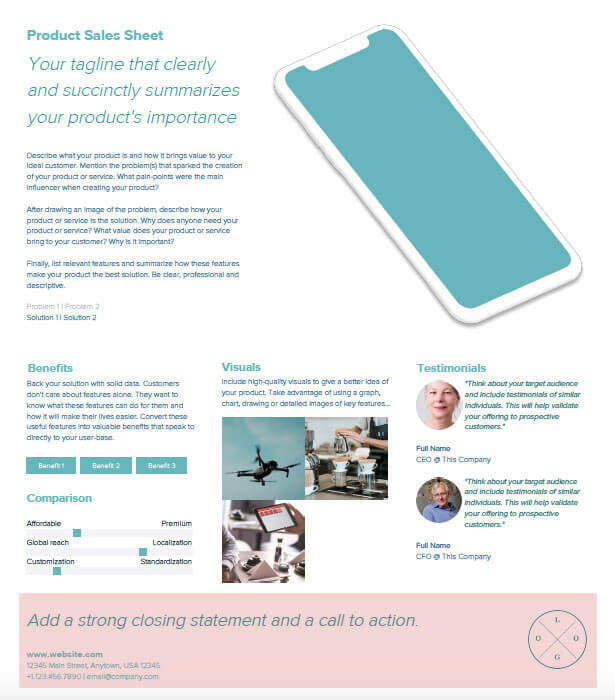 On your sales sheet, you will have a chance to “visualize” what your product does; and scientifically proven, your chances of being remembered will be higher when using visual cues. To be able to do this successfully, take advantage of graphs, charts and images. Let them do the sales for you. When showcasing images of features, try to relate the benefit this feature provides. When it comes to sales and marketing, no other efforts will outrank the effect your user testimonials and reviews have on potential customers’ purchasing decision. If you’ve already built long-term relationships with some of your customers, that’s great. This is exactly where you want to use their positive reviews and feedback about your product or service to build trust around your brand. Utilize professional testimonials that align with your benefits and value proposition to have the greatest effect. In the early stages, it can be difficult to build a strong relationship with your customers and you might not have references to use on your sales sheet. If you are at this stage, try to reach out to some of the professionals who got to know your product and were satisfied with the results. Now that you have nicely described your idea, outlined why it is the solution to a specific problem and given reader a clear visual of your product or service, you need a call to action. Think about what you want the reader to do when they’re done reading your sales sheet. If it’s a product, the most obvious CTA is to get in touch to make a purchase. If your sales sheet is highlighting a service, you may have reader visited your website for more information, signup for your newsletter or join a demo. Finally, insert your email address, phone number, website, relevant social media links and your logo in the footer. This is how people will know how to get in contact with you to learn more about purchasing your product or service, and this is also an opportunity to build brand recognition, so make sure that all of your contact information is correct! After you’re done putting all of your content in the sales sheet, it’s time to review. Before you share this document with multiple people you want to make sure it looks professional and tells the right story. Once you double-check your work, you’re ready to share your sales sheet and start gaining interest and making sales. The beauty of creating ‘living documents and presentations’ with Xtensio is that your folios adapt to different stages of your work. We recommend sharing your sales sheet as a responsive weblink as an easy way to quickly send your sales sheet to your email list, embed it on your website or use it as digital marketing collateral. You can also export your sales sheet as a PDF or PNG file, and you can even customize your folio for print. 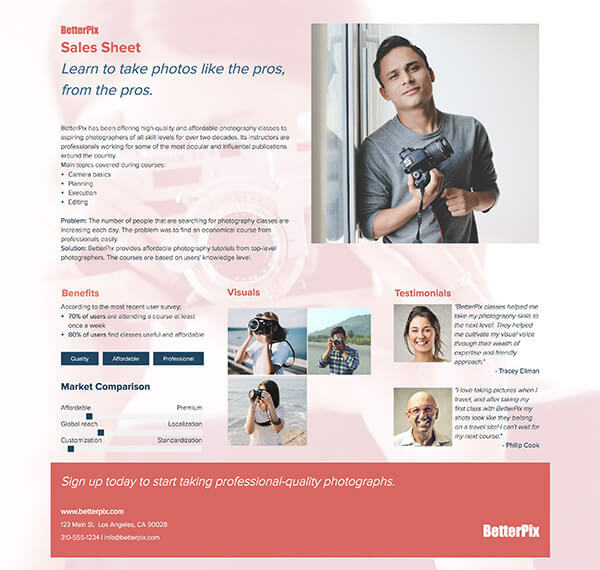 The Sales Sheet template is adaptable just like other Xtensio tools, it can and should be repurposed, revisited, and revised to suit your evolving needs. You can always add, delete, and move your modules and sections around with Xtensio’s versatile editor to adapt the sales sheet as you need it. And your team can collaborate on your sales sheets in real-time, making sure everyone with the link sees the latest updates as they are made. This multipurpose business essential can help you attract investors, reach new customers, recruit new employees, and reach many other goals. Enjoy the journey! Xtensio is a business communications platform where teams create, manage, present and share beautiful living documents. By clicking "Get Started - Free" I agree to Xtensio's Terms of Service.